Biscuit Taco Pockets are a quick and easy snack that everyone in my family loves!! Seasoned ground beef, melty cheese and salsa all tucked into a tidy little bite! PIN IT to your APPETIZERS BOARD to save it and share it! 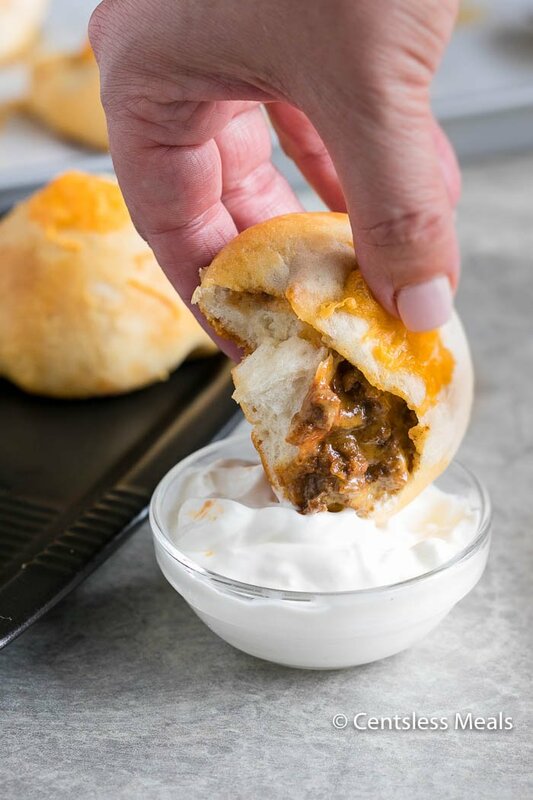 Biscuit Taco Pockets are a simple and easy way to change up your Taco Tuesday! 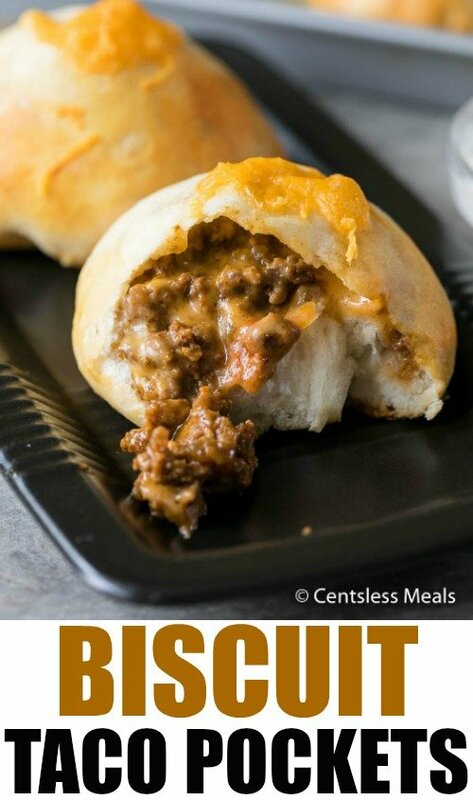 Delicious seasoned beef and salsa all smothered in melted cheese and encased in a soft biscuit. These are the perfect bite sized snack! I simply love taco inspired dishes! From my Easy Crockpot Chicken Tacos Recipe to my Taco Casserole with a Surprise Crust, I love to find ways to incorporate zesty taco seasoning recipes into my weekly menu plan. When I am making a recipe that requires taco seasoned ground beef, I like to brown a large batch using my favorite homemade taco seasoning. I divide the taco meat into servings and freeze them in freezer bags. The result is an easy meal in minutes any day of the week! These are perfect for quick tacos, quesadillas or even to add to a taco salad! This is the perfect solution for busy weeknights or when unexpected guest pop in and you need a quick plate of loaded nachos! Don’t stop at using ground beef. I like to use chopped chicken breast (fresh or left over) or ground turkey as well. Sometimes small changes to a recipe can make it seem totally different and interesting. Another great idea is to add canned refried beans and black olives to these packets as well – so delicious! When my kids need a quick and filling snack, my go to recipe is Biscuit Taco Pockets. These little bundles are perfect to pack in their school lunches and reheat beautifully. Your kids can choose to warm them up in the microwave or simply enjoy them cold, either way it is a one lunch option they won’t want to trade! 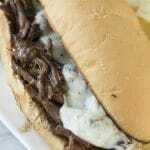 One quick note, you will not need much ground beef to make this recipe and will likely have a bit of meat leftover; this freezes perfectly. You will use approximately half of a packet of taco seasoning. Reserve the remaining seasoning to add to sour cream as a dip or to add to some zip to another meal such as soup or chili. We serve these with a dish of sour cream for dipping and I often mix in a couple of spoonfuls of salsa or chopped jalapenos to spice up the sour cream! 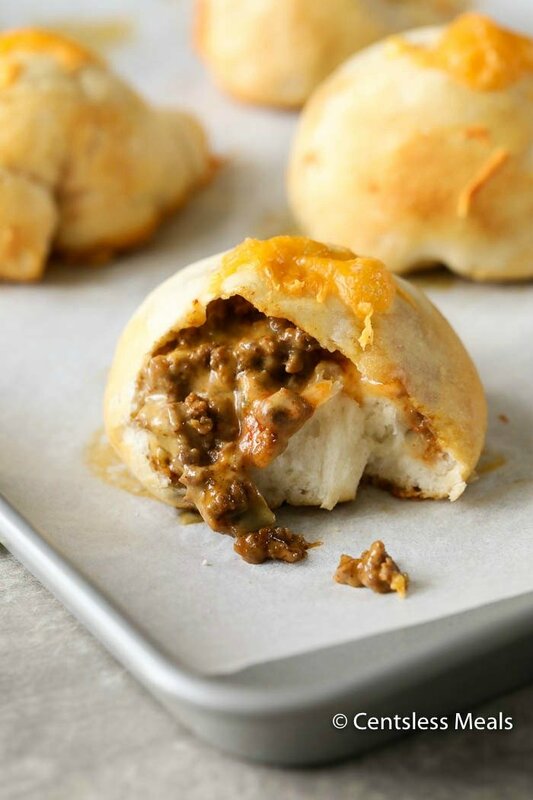 Whether you need a fast and easy appetizer or simply looking for a side dish to accompany a bowl of Mexican tortilla soup or a taco salad, look no further than Biscuit Taco Pockets. 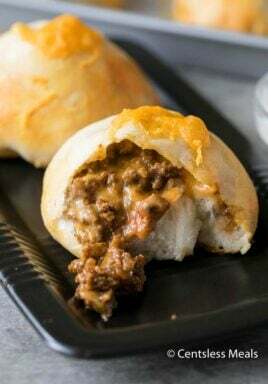 Seasoned ground beef, melty cheese and salsa all tucked into a tidy little bite! Brown the ground beef and crumble. Drain any fat. Add taco seasoning and 1/3 cup of water. Simmer 5 minutes or until thickened. Cool slightly. 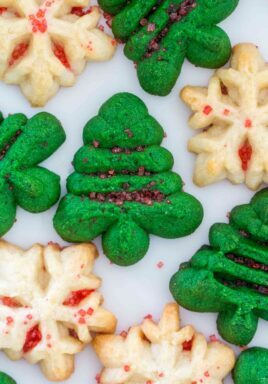 Roll out biscuits so they are flat and thin. Add 1 cube of Velveeta, 1 tablespoon taco meat and 1 teaspoon salsa. Fold biscuit around the fillings and pinch seams to seal well. Place seam side down on a parchment lined pan. 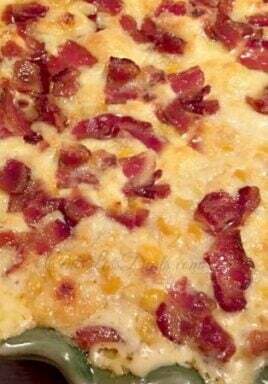 Brush with butter and top with 1 tablespoon cheddar cheese. Bake at 350 degrees for 13-16 minutes, or until tops are lightly browned. Thanks for the receipe, and I made notes on someof the comments made. I can hardly wait to try. Thanks! You’ll be happy you did Camille! Enjoy! Use GRANDS for a better size…I used a 3Blend Mexican cheese, added some crushed blk olvies and a bit if green chili to the recipe and Boy O Boy.. were they yummy! Thx for the idea!!! These were fun and SO good! I used 9 frozen rolls (Rhodes brand, to be exact) and it worked perfectly! I did cut the cream cheese in half because all I had was 4 oz and I’m glad I did. This is going to be a regular for those nights when I can’t decide what to make. I didn’t get the same result as the picture. How do you get that much filling in the biscuit. I rolled out the biscuit to about 3-4 any more and they would be pulling apart, followed the amounts to put in. rolled out the top biscuit and pinched shut. Mine were not full like the picture. Anybody try this and let me know what you did. It did taste good.